When we worked together years ago, several former co-workers and I would get together at the holidays to have afternoon tea at the Ritz-Carlton Boston. It was a fun and delicious way to get out of the office for an afternoon and talk about anything but work. Over the years my colleagues have left but our core group has kept the tradition alive. I think we've been doing this for at least10 years now. We don't exchange gifts per se but we often bring a little something for each other. Last year I had little gift bags with a jar of jam, tea, and a holiday tea infuser. 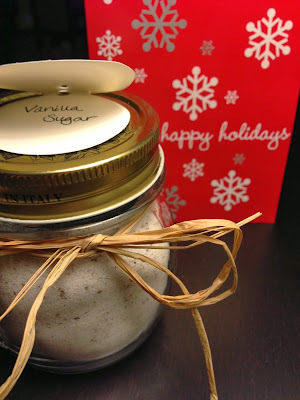 This year, after coming across a supply of vanilla beans, I decided to make Jamie Oliver's Vanilla Sugar. In the early days of his Naked Chef television show, I remember watching an episode where Jamie Oliver made baked stone fruits with vanilla sugar. 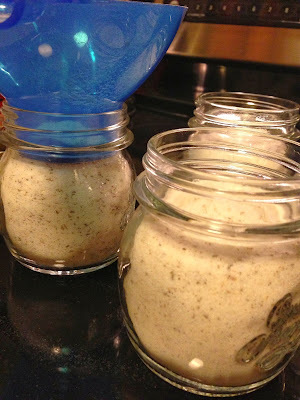 Unlike most recipes that have you bury a vanilla pod to infuse the sugar his recipe called for blitzing whole pods with the sugar in a food processor. This was the method I chose. I tried to find the recipe on his web site or on the Food Network site but it's not posted. I saw some different versions online so this is what I ended up doing. 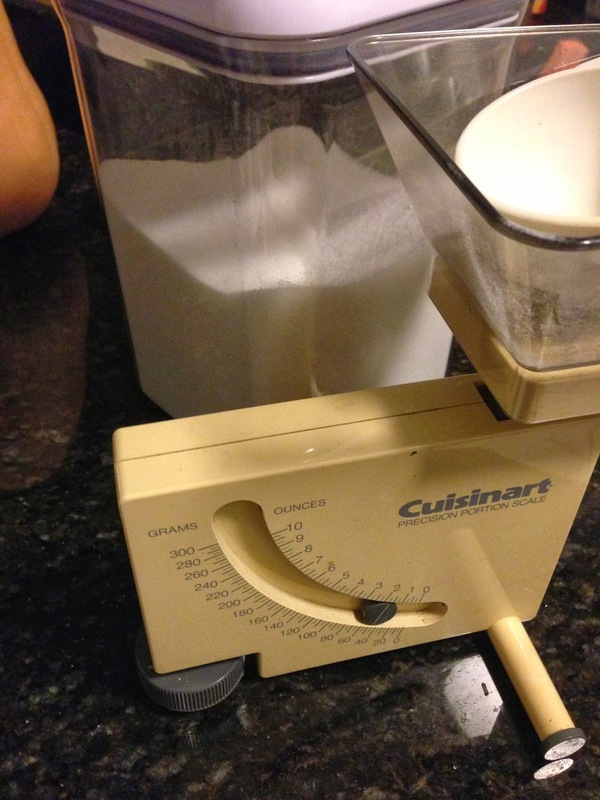 The recipe calls for two pounds of superfine sugar. Since I didn't have any superfine sugar I started with regular granulated sugar and blitzed it for two minutes on its own. The key to doing this is to cover your processor with a dish towel to minimize the sugar dust that will inevitably coat everything in the vicinity. I read about this once and even with the dishtowel I had a fine coating of sugar everywhere. 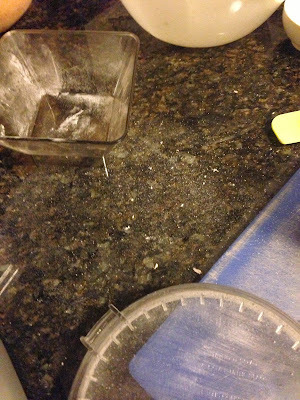 I had to do this in two batches because two pounds was just too much for my food processor. Once I had the sugar to the consistency I wanted I put it aside. 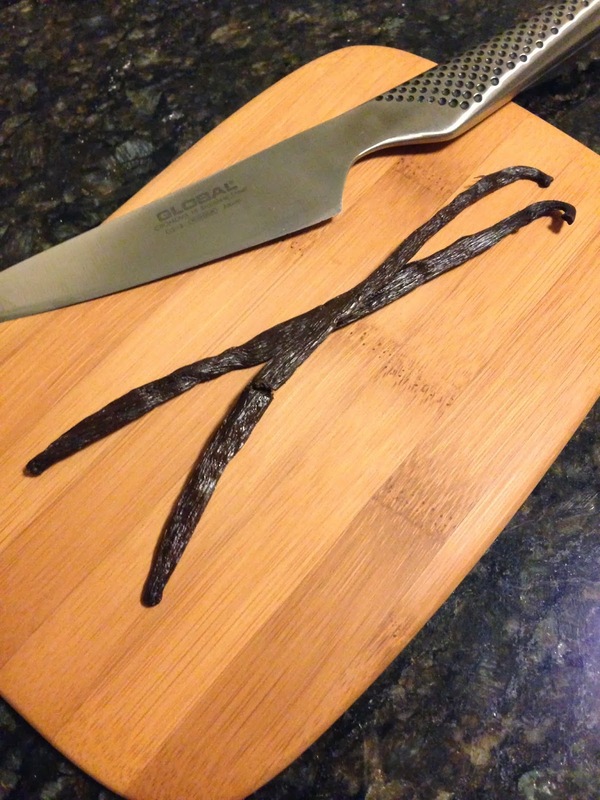 I split the vanilla beans lengthwise then cut them into 1-inch pieces and placed them in the processor. I blitzed it until it was as fine as I thought it would get. I then returned the sugar to the processor and continued to blitz it to further breakdown the vanilla beans and to incorporate everything together. I sieved everything to catch the larger pieces and continued to process the pieces until it was as broken down as I thought they'd get. Any large pieces I put aside for myself (they weren't gift-giving worthy so I'll just use it for vanilla sugar for myself - waste not, want not). I put the sugar into pretty jars and they're ready for giving. A quick Google search brings up all kinds of uses for vanilla sugar - desserts, French toast, you could probably even use it as a flavoring in coffee if you wanted. I hope my friends like it. Split the vanilla beans in half lengthwise then cut crosswise into 1-inch pieces. Put the vanilla into a food processor and blitz until the vanilla is in fine pieces (or as close as you can get in your processor), scraping the sides down periodically as needed. Add the sugar and process for another two minutes to incorporate. Sift the mixture to catch any large pieces and place them back in the processor to blitz further (you may want to do this a few times depending on how fine you want to get the pieces). The mixture will be ashy colored and have flecks of vanilla. I'm glad you posted this. I watched the same show years ago. This looks like the process he used. My mixture is mellowing in the jar, so the taste tests haven't begun.